The Wahbiang Christmas Party has always been a very important and significant gathering for my clan of very very good friends. It has been a tradition started back in 1993 and we have been meeting faithfully for the past 15 years. Since we started to have our own houses, we took turns to host this event. It is an annual event which I always look forward to and one I solely missed so much. For this is the one event that brings deep joys and connections to all of us. Over the years, there have been big changes in all our lives. People come and go – that is a nature progression of things. Some bonds were strengthen and others waiting for a chance to be reconnected. I was pretty worried that this tradition of hosting the annual Christmas gathering will cease after I left for China two years ago. But I am so happy that my good friends (from Dunman, DCS, Temasek) stick togther and organised it so well. Gone are our tradition to bring good cause to the poor and sickly (that is my only regret). Over the years, BoTian Home for the Aged has became such a big organised home with good funding. Back then, we were only struggling students – we don’t have the kind of money we had today – we decided not to spend good money on clubs and dinners during Christmas and used this "dinner money" for the poor – that is the reason we have been having humble Christmas gathering at home. It was indeed a good begining to our noble gesture. We should retain this goodwill of "giving" in our daily lives – not just for Christmas. It makes the counting down to Christmas Day more meaningful to all. 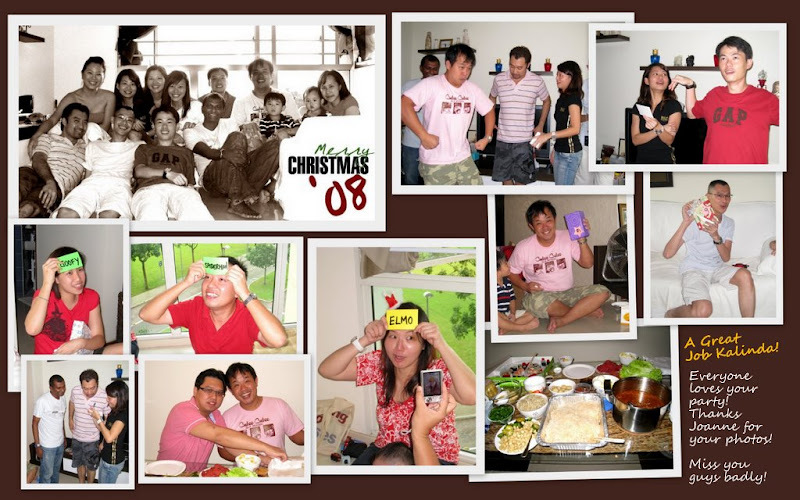 This year, Joanne hosted the Christmas and we had our 1st ever afternoon gathering. Kalinda took up the heavy role to organise the whole party. Trust me, it is a heavy role when you have to "round up" all the busy friends. I was guilty for not being around – as I took my wife, kid and Tracy up to Korea. Sam and family were in Italy. And I wonder where’s Jimmy too. Yeah… we should be there.. no matter what. Perhaps, that is the least effort I should put in in my coming years to come. Friends are the most important asset – second to family. They are the one who see me through all main stages of my lives – from my graduation day to my wedding night and to the moment when I became a father. Some friends were with me during my times of career…following and supporting throughout my days in VOXmedia, Caffeine and now Ogilvy. And some friends I miss so much are now away in Beijing and Shanghai. I hope it is not too late to wish all of my friends a good festive season! Merry Christmas to all my Wahbiang Clan. And to all who read my blog so faithfully.